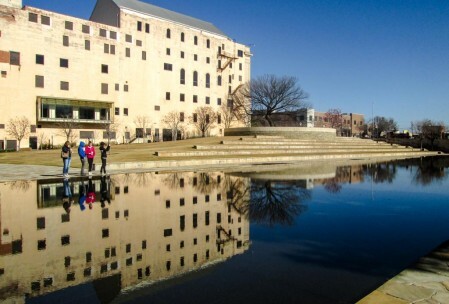 Every time I’ve asked locals what there is to see and/or do around here, I have been told I need to go to the Oklahoma City Bombing Memorial (I don’t think it’s called a bombing memorial, but calling it a city memorial makes it sound like OKC no longer exists). This advice has always seemed strange, since, if it truly is nice, then it should truly also be a total downer. And I’m not sure when I’m supposed to be eager for a good downer. Anyway: my good friend Thomas was in town for a couple days last week, so I finally went to the memorial. It is nice. It is quite a downer. The outdoor memorial (photos below) is very nice. It’s respectful and serene. It would be a good place to meditate quietly. 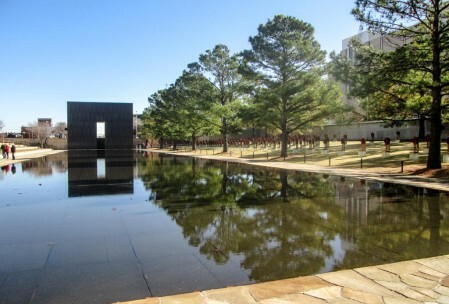 It includes a couple of obelisk-gates at either end of a reflecting pool, with the time before the bombing (9:01) and the time after the bombing (9:03) etched in large numerals, symbolizing the time when innocence/ignorance ended and the time when rebuilding began. There are also a bunch of chairs, one for each victim, off to the side in the grass. In one of the videos that play in the museum a kid mentioned that he thought his mom would be happy to be represented as a chair so that people, when they were tired, could rest there. I don’t actually think you’re supposed to sit on them though. The reflecting pool. Chairs (with Christmas wreaths) are over on the side there. The museum is housed in the building shown. The blackened tree seen at the top of the mound survived the bombing. If you never went into the museum, you could skate by without enduring the heavy. But if you do go inside: it is a very effective museum. It does an excellent job of making you re-experience the events of the day. You start by going through displays of relevant news stories (e.g., regarding the Waco ATF situation) and period artifacts (e.g., an old car phone) leading up to the date of the event. Then you enter a room hear some chatter (a recording of an actual court proceeding that was occurring in a neighboring building), the bombing occurs (a deep, muffled, distant sound), and you exit the room to experience the immediate (and later) aftermath. A lot of videos with first-hand accounts from survivors and rescuers. Artifacts, such as jewelry and watches found in the rubble and twisted metal from adjacent buildings. Televised news reports from the day of the event. Really effective, really sad, a lot of people lost their kids and the museum makes sure you feel it*. * They don’t by any stretch go over the top on the “kids died” theme. In fact, they’re rarely explicit that this even happened. Instead, they merely make clear that (1) there was a day care center on-site and (2) after the bombing, a lot of parents were looking for their children. Often (usually? ), though, implicit information hits harder than explicit and this is the undercurrent that tows you throughout the museum experience.